Dum complerentur Regensburger Domchor. Hans Schrems, Director, 1970. O vos omnes A beautiful holy week motet. The Philippe Caillard Vocal Ensemble. 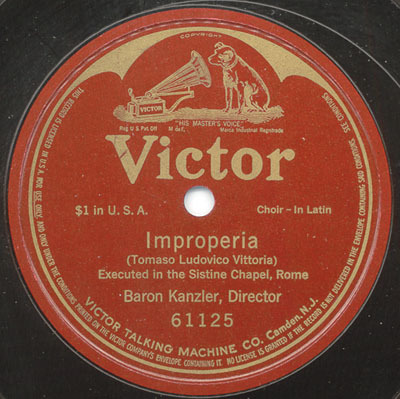 Erato recording from the 1950s or 1960s. O magnum mysterium The Dessoff Choirs. Paul Boepple, Director. Early 1960s recording. Regem coeli Wiener Sangerkanaaben. Chorus Viennensis. Hans Gillesberger, Director. Surrexit paster bonus Regensburger Domchor. Hans Schrems, Director, 1970. Una Hora Wiener Sangerkanaaben. Chorus Viennensis. Hans Gillesberger, Director. Vere languores Ensemble vocal M. Couraud. French recording from 1940s. Vere languores The Roger Wagner Chorale. 1960s. Vidi Speciosam Regensburger Domchor. Hans Schrems, Director, 1970. Victoria's two-part magnificat is a musical treasure. Magnificat for Three Choirs The Dessoff Choirs. Paul Boepple, director. Early 1960s recording. Ave Maris stella the Schola Cantorum Saint Foillan, Wilhem Eschweiler, Director. Vexilla regis The is one of the finest of Victoria's hymn settings. Vexilla regis is sung during holy week and uses a text written by Thomas Aquinas. The Philippe Caillard Vocal Ensemble. Erato recording for the 1960s. Vexilla regis (More Hispano) The is Victoria's settings of the melody sung in Spain for the hymn Vexilla regis. Coro de la RTV Espa�ola. C�sar Sanchez, director 1968. Agnus Dei from Missa Quarti Toni The Philippe Caillard Vocal Ensemble. Erato recording from the 1960s. Requiem for Six Voices The Dessoff Choirs. Paul Boepple, director. Early 1960s recording. Benedictus Dominus Monks of Santo Domingo de Silos and Boys choir of Burgos, Ismael Fernadez de la Cuesta. Hispavox recording from the 1960s. Improperia Monks of Santo Domingo de Silos and Boys choir of Burgos, Ismael Fernadez de la Cuesta. Hispavox recording from the 1960s. Miserere mei, Deus Monks of Santo Domingo de Silos and Boys choir of Burgos, Ismael Fernadez de la Cuesta. Hispavox recording from the 1960s. Matins: First, Second and Third Nocturn: Good Friday Monks of Santo Domingo de Silos and Boys choir of Burgos, Ismael Fernadez de la Cuesta. Hispavox recording from the 1960s. Passion of Saint John This passion is Sung on Good Friday Mass of presanctification. It describes...from Gospel of John. Monks of Santo Domingo de Silos and Boys choir of Burgos, Ismael Fernadez de la Cuesta. Hispavox recording from the 1960s.